Evaluation with Power becomes more important in the social sector every day. Donors no longer reward good intentions, they reward results. This book can help social sector leaders manage for the mission and measure results. Evaluation with Power transforms evaluation into a powerful tool nonprofits can use to help their organizations progress and change in ways that lead to greater achievement of mission. Building on THE INDEPENDENT SECTOR'S ongoing research on evaluation, it is a practical, comprehensive handbook for turning program, process, and organizational evaluation into a positive learning experience that connects performance to mission. The book focuses on the needs of the nonprofit and reveals the sort of evaluation that is most appropriate to and helpful for nonprofits. Leading experts from a wide range of show how to use evaluation in key organizational areas, including program design, human resource management, information systems, volunteers, and more. SANDRA TRICE GRAY is vice president of INDEPENDENT SECTOR where she heads the Effective Sector Leadership and International Initiatives Program. Previously she served as an assistant commissioner with the U.S. Department of Education. 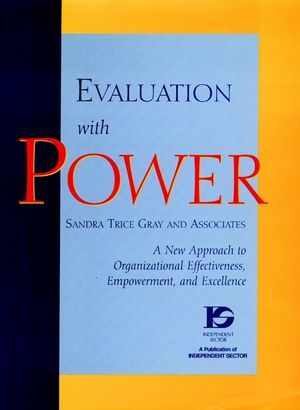 MAKING EVALUATION A USEFUL MANAGEMENT TOOL (by Sandra Trice Gray). Ongoing Evaluation: A New Approach. The Board's Role in Evaluation. How Volunteers Can Contribute to Evaluation. Using Client Feedback to Improve Programs and Services. USING ONGOING EVALUATION TO IMPROVE PROGRAMS AND SERVICES. Organizational Behavior and Policy (A. Merget & E. Weaver). Program Effectiveness and Outcomes (J. Seeley). Human Resource Management (D. Young & H. Doerman). Information Management (R. Millett & M. Lelle). Resource Development (P. McE. Buchanan & T. Hurwitz). Ethics and Accountability (J. Belk & M. Daignault). Adapting the Evaluation Process to the Organizational Culture (R. Adamson & E. Weaver). Using Outside Evaluatorsv (P. Patrizi & J. Sanders).